Thanks for endless hours of entertainment. I really don't know what I would've done this winter break had four seasons of 30 Rock not been on Netflix's instant view (ok maybe writing cover letters would have been useful). Anyways, I decided to bake you cookies. Oatmeal raisin is my favorite type of cookie. And Texan pecan pie is to die for. So why not combine the two? I hope you enjoy these cookies as much as I do! Place the pecans on a baking sheet and bake for 5 minutes. When done, chop the pecans. 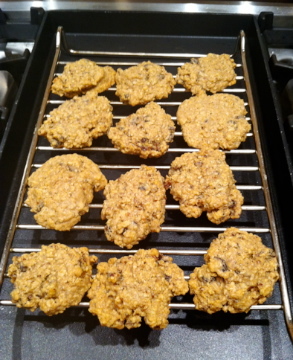 For a chunkier cookie chop them very coarsely; however, I like to chop them pretty finely so that they become part of the batter, but they still add texture. 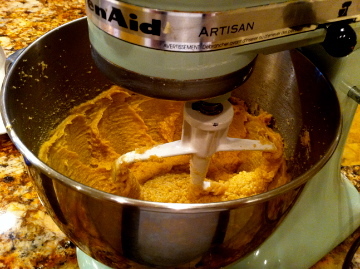 In the bowl of an electric mixer with a paddle attachment, cream the butter and both sugars together on high speed until the mixture is smooth. Then with the mixer on low, add the eggs and the vanilla. Sift together the flours, baking powder, cinnamon, and salt into a bowl. With the mixer on low, gradually add the dry mixture to the batter. Stir in the oats, raisins, and pecans. Drop tablespoon mounds of dough onto a sheet pan lined with parchment paper. Flatten each mound slightly with the back of a spoon or with a damp hand. Bake for about 15 minutes. When done, transfer the cookies to a rack and let them cool. I can't get enough pumpkin, I never even knew I was such a fan until this year. There are just so many different ways to cook it and not nearly enough time in the Fall season. Pumpkin pancakes had been on my mind for weeks so the other night - in honor and celebration of Lil Wayne's release from prison - I finally gave into my craving and whipped up some pancakes for my roommates and guests...and it rocked their world. 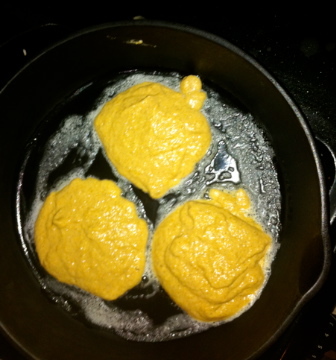 Part of my delay in making pumpkin pancakes was that I couldn't settle on a recipe. I found one that looked rather delicious, but it called for apple cider vinegar...which, whatever it may do, just did not sound enticing in pancakes. But I thought I would try it out anyway for experimental sake, and it was a great success. As usual, I substituted whole wheat flour for white flour. The original recipe called for ginger, but we didn't have any so I spiced them with cardamon and freshly-ground nutmeg instead. I also opted to use skim milk and added a little extra pumpkin. 1. Mix together the milk, pumpkin, egg, oil and vinegar. Then in a separate bowl, combine the flour, brown sugar, baking powder, baking soda, cinnamon, nutmeg, cardamon and salt, stir into the pumpkin mixture just enough to combine. Who can't resist a hearty breakfast muffin full of fall flavors? I searched and searched to find the ultimate pumpkin muffin recipe and finally, with a number of revisions, found something magical. This recipe uses no oil or butter, but the applesauce and pumpkin make the muffins plenty moist... and only about 150 calories each! The original recipe called for white flour and white sugar, which I substituted for whole wheat flour and brown sugar. I cut down the amount of sugar, increased the amount of pumpkin and used cinnamon applesauce rather than oil or butter. The recipe yields 24 muffins, I made 12 muffins and a mini loaf instead. I topped the loaf with a brown sugar and cinnamon topping for a sweeter alternative. 1. Preheat oven to 350 degrees F, grease the muffin pans. 2. In a large bowl, combine the flour, brown sugar, baking powder, baking soda, salt, nutmeg and cinnamon. In a separate bowl, mix the eggs, pumpkin, and applesauce, until smooth. Mix in the dry ingredients. Stir the raisins and walnuts into the batter. Spoon batter into the prepared muffin cups. 3. Bake for 30 to 35 minutes, or until a toothpick inserted into the center comes out clean. Let's be honest, you can't really ever go wrong with butternut squash. And these delicious enchiladas certainly exemplify this. In fact, this meal was so scrumptious, and it so wonderfully combined the essence of Fall, the Southwest, and Halloween that we are convinced that these enchiladas are quite magical. That is why we would like to cook this meal for Harry Potter himself-- Mr. Daniel Radcliffe. Also, this tidbit doesn't hurt either. Serve the enchiladas with Mexican rice and black beans (the orange of the squash and the black beans make this a great Halloween dish). 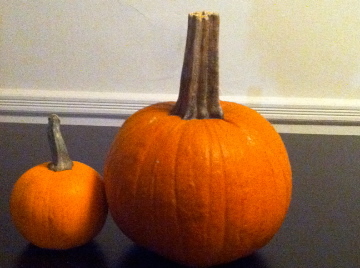 To get in the spirit of things, pair the meal with some seasonal Harvest/ Pumpkin Ale. Or if wine's more your thing, Vampire wine makes a fun thematic pairing. Perhaps Robert Pattinson should get a meal invitation, too. *Note: We were entertaining, so we made a enough enchiladas to feed the group (about 10 people with 2 per person). Feel free to cut the recipe in half. However, they do make great leftovers. Start by re-hydrating the dried red chiles. In a skillet on high heat, toast the red chiles on each side until they start to puff a bit. It should take about 15 seconds on each side. Cover the chiles with water, and leave the heat on. Once the water boils, turn the heat off, and let the chiles soak for about 30 minutes or until soft. Drain the chiles, and add them to a blender. Heat 2 teaspoons of oil in a skillet with the onions and cook until onions are translucent (about 10 minutes). Add the garlic and cook for another minute. Combine the onions and garlic with the chiles in the blender. Then add the canned chiles, the tomatoes, chicken broth, cumin, oregano, and epazote. Blend until mixture becomes a smooth sauce. Heat 2 teaspoons of oil in a pot over low heat. Add the sauce and simmer for about 20 minutes, stirring occasionally. Add a bit of salt and pepper. Place butternut squash in a greased pan. Roast the squash in a 350 degree heated oven for about 45 minutes, or until soft. Keep the oven heated for later. Heat the oil on a medium-low heat in a large skillet. Throw in the onions and cook until translucent (again about 10 minutes). Add the garlic and cook for another minute. Throw in the butternut squash, cilantro, cumin, and nutmeg. Saute for about 10 minutes. With a potato masher, mash the mixture until the it is the consistency of lumpy mashed potatoes. Season with a bit of salt and pepper. In the 350 degree oven, place foil wrapped corn tortillas and warm for about 3 minutes. Remove the tortillas from the oven and remove from the foil. Brush each side of the tortillas with the sauce and place in a baking dish. Add a spoonful or two of the filling down the center of the tortilla and roll it up. Repeat these steps until all tortillas are filled and sauced. Pour most or all of the remaining sauce over the enchiladas. You may have extra sauce left. That's ok-- it makes great chip dip! Finally, sprinkle the cheese over the enchiladas (if you're using the cotija, wait to top the enchiladas once they're done baking). Bake the dish for about 10 minutes. Serve with a dollop of sour cream, black beans, Mexican rice, and a yummy beverage! Much Love and Happy Halloween! President Bill Clinton spoke at our lovely Bryn Mawr College today. According to a recent New York Times Article, the former president is now a vegan. Considering he was chomping away on hot dogs during Hilary's campaign trail, we're going to guess that President Clinton is none too happy about this dietary change. Well Bill, have we got the perfect recipe for you! This mushroom soup is so hearty and creamy that it won't even cross your mind that it is healthy or vegan. The mushrooms provide that meaty flavor that former meat-eaters may crave. A potato, rather than artery-clogging cream, is added to provide the soup's creamy texture. Separate the stems and caps of the white mushrooms. Quarter the caps, and set aside. Add the stems, shitakes, water, and broth to a large saucepan and bring to a simmer. Cover for about 30 minutes. Once the stems are done simmering, pour the broth over a cheesecloth or paper towel lined strainer over a bowl. Make sure to squeeze out any of that remaining tasty liquid from the mushrooms. Then you can trash the stems and shitakes, or set aside the shitakes for a garnish. If the broth needs a bit of salt and pepper, go ahead. In a big heavy pot, heat up the olive oil. Add the onions once the oil is shimmering and cook them until they're tender and golden, stirring so they don't burn. Stir in the garlic. Add the mushroom caps. 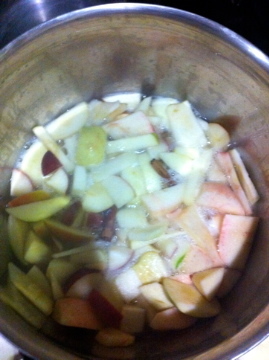 Stir the mixture for about 10 minutes. Then add in the sherry and soy sauce, and cook for a couple of minutes. Add the mushroom broth. Next come the bay leaf, thyme, parsley (you can tie these together with string if you've got some), and finally the potatoes. Cover the pot, and simmer for an hour. Once all simmered up, remove the bay leaf, thyme, and parsley. The soup is then added (in batches of course!) to a blender. Blend, until the mixture is perfectly pureed to a silky texture. Return the soup to the pot, and season with a bit more salt & pepper, and perhaps a squeeze more of fresh lemon juice if you want. Serve the soup topped with the shitakes (croutons don't hurt either). Enjoy! Last week we went apple picking. 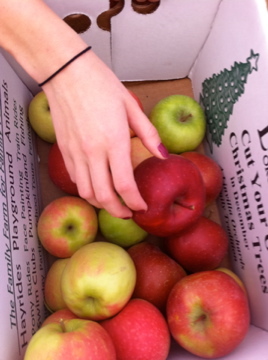 I guess we got a little over excited because we returned with a whooole lotta apples. Good thing I loooove applesauce! Seriously. This one time I tried to bring my favorite applesauce through airport security and it got confiscated. My mom put up a fight with the TSA officers, but alas my applesauce did not make it home to Houston. *Note: Ali G had the great idea of keeping the skin on some of the apples. I think this really added to the wonderful flavor and texture of the applesauce. Of course, you can do without the skin if you don't wanna get in those extra vitamins. (I would just be careful with the nutmeg which has a really strong flavor in small doses). If you like your applesauce hot (yummm), serve it immediately! If you're a weirdo and you don't, stick it in the fridge to cool off.